It will come as no surprise that a well-rested employee is a more productive employee. What might raise eyebrows is that organisations can do their part to help with that. Most employers see sleep deprivation as a personal issue that has little or nothing to do with the workplace. It’s the duty of each of us to ensure that we organise our lives such that we get the sleep we require in order to be at our best in the workplace. The reality is that while everyone skips a few hours kip here and there occasionally, if an individual is doing this regularly it can have a significant impact on their health, wellbeing and subsequently, their performance at work. To be clear, employers are not legally responsible for employee’s sleeping habits. They do, however, have a few key things to consider. 1. There must be at least 11 hours rest time between working days. This is not much of a problem in most 9-5 environments but needs to be factored into timetabling for shift work. 2. If an employee is not getting enough sleep due to work-related stress and the business does not endeavour to resolve this, they may be failing in their duty of care. 3. Lack of sleep can result in health problems, irritability or loss of concentration which can all result in costly incidents for an organisation. Independent research institute, RAND Europe, found that insufficient sleep cost the UK around £38bn in 2016. That amounts to 1.86 percent of GDP – not an insignificant figure. It’s not an insurmountable problem though. RAND’s research found that encouraging people who usually sleep less than six hours a night to sleep instead for six to seven could make a huge difference to the economy. Except for a few notable people such as Donald Trump and Margaret Thatcher, who can get by on just four or five hours sleep a night, most of us need around seven to nine hours most nights. It is a common misconception that when we sleep everything goes into shut-down, in fact in many ways the complete opposite occurs. This is the time that our bodies reset, restore and process. Not only does sleep aid physical recovery it is also the time that our brain lays down memories and consolidates information gathered during the day. During sleep we literally move information from short-term memory to long-term memory. In fact, a good night’s sleep actually aids memory during the first few hours after we wake. On the other hand, persistent lack of adequate sleep can cause difficulty concentrating and focussing. It is harder to make decisions and low mood, or mood swings become more prevalent. In addition, reactions will be slower and there’s more chance of drifting off during the day, making accidents much more likely. Another myth is that we can ‘catch up’ on sleep. Unfortunately, this is not true. If an individual is persistently not getting enough sleep during the week, they can’t simply sleep in at the weekend to make up for it. That ‘sleep debt’ will continue to accrue and potentially cause long term negative effects. Lack of sleep is now being linked to high blood pressure, heart disease and diabetes. It is also known to reduce immune systems and so the sleep deprived have a higher chance of catching whatever is going around the office. We are also gaining greater understanding of the relationship between sleep and mental health. While sleep is, of course a largely personal issue, sleep deprivation can have significant, costly and far-reaching effects on businesses. So, employers need to take it seriously. Business in the Community and Public Health England have joined forces to create the Sleep and Recovery Toolkit. Educate – Offer training to managers and employees on the importance of adequate sleep. Explain the range and limitations of support that can be offered by your organisation. If necessary, bring in external support. Communicate – Make sure that encouraging adequate sleep is a core factor of any health and wellbeing policy. Spread the word that the issue is not simply personal and encourage employees to pinpoint causes of sleep deprivation that can be resolved in the workplace or with the support of the business. Facilitate – Understand how the workplace influences employee’s sleep and work to manage those. Recognise causes of stress and work to reduce them. For example, be mindful of overtime requests, or expectations on staff to check email 24/7. Engage with occupational health specialists to ensure that the working environment is not contributing to lack of sleep. An organisation that is sleep aware can work to reduce the macho culture that celebrates sleep deprivation and presents sending and receiving midnight emails as dedication. While many of today’s work ethics and economics require everyone to tighten their belts, businesses should be mindful of the pressures they are placing on their employees. They need to consider their job requirements versus their employee’s health needs. The line between work-life and home-life is increasingly blurred. 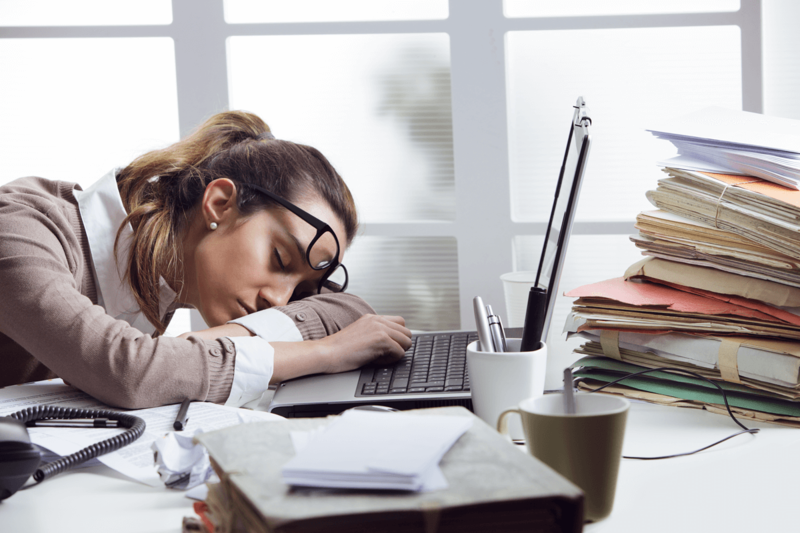 If work creeps into an employee’s personal time, resulting in sleep deprivation, the negative effects of lack of sleep will begin to cost the business, sooner or later.